Exactly the appetizer you’ve always wanted! You get Fresh Chips, plus 3 more: Fried Ravioli, Mac’n Cheese Bites, Pretzel Sticks, Hand-Breaded Zucchini, Potato Pancakes, Fried Cheese Sticks, Onion Rings, or Even More Chips! With homemade Ranch dressing on the side. Served with Buffalo Ranch on the side. Pretzel Sticks served with beer cheese (adds 120 cal) and pub mustard (adds 210 cal). With bacon bits, cheddar cheese sauce, and Southwest seasoning. Mixed greens topped with granola, marinated and grilled Granny Smith apple slices, fresh grapes, celery, and carrots. Served with Apple Cider Vinaigrette. Add some spice to your salad! 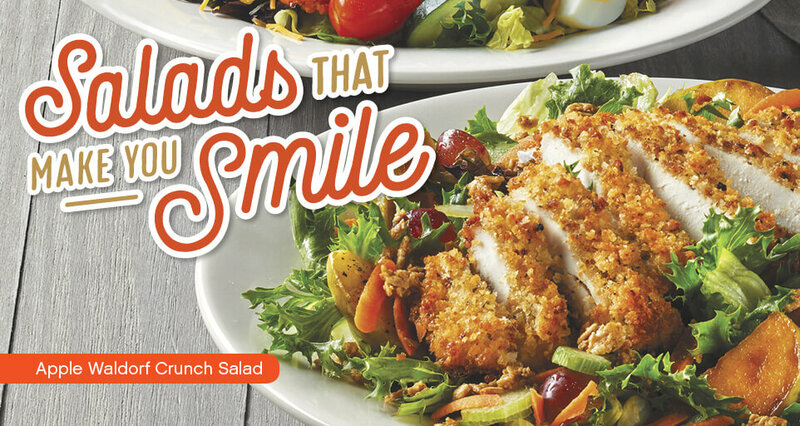 Mixed greens, cucumbers, tomatoes, egg wedges, French fries, and cheddar cheese, topped with your choice of crispy Buffalo chicken fillets or grilled Buffalo chicken breast. Mixed greens topped with tomatoes, cucumbers, fries, egg wedges, and cheddar cheese. Your choice of dressing, on the side. A double-decker third-pound of beef, melted cheese, pickle slices, shredded lettuce, and Sauce Supreme. Original Superburger and your choice of two sides. Original Superburger, one side, and a soft drink or iced tea for only $7.99! Let us know what kind of soft drink you'd like when you arrive to pick up your order. It's Ginormous! Two 6 oz. chargrilled Black Angus burgers with cheese, pickle slices, shredded lettuce, and Sauce Supreme. It's Ginormous! Two 6 oz. chargrilled Black Angus burgers with cheese, pickle slices, shredded lettuce, and Sauce Supreme. Served with your choice of two sides. Grilled to thrill! A 6 oz. Black Angus burger between two slices of buttery, grilled Texas toast with melted American cheese, grilled green peppers, onions, and mushrooms with a hint of yellow mustard. Big on barbeque? This burger’s for you! We start with a bed of BBQ seasoned fries, then top them with a 6 oz. Black Angus burger, cheddar cheese, crispy bacon, onion rings, and BBQ sauce. Everything is better with sautéed mushrooms and onions. Cheese-free. Served simply with lettuce and tomato. Topped with the cheese of your choice, lettuce, and tomato. Go green with a vegetarian patty, lettuce, and tomato. The heat is on! We toss a crispy fried chicken breast in our spicy Nashville sauce, then serve it on a soft brioche bun with lettuce and dill pickles. Wrap-tastic! We load a flour tortilla with Buffalo chicken fillets, cheddar cheese, lettuce, tomato, and your choice of homemade Ranch or bleu cheese dressing. Dig in to juicy, sliced rib-eye steak with grilled onions and melty American cheese on a fresh-baked hoagie roll. We're gonna need a bigger bun. Reel in our HUGE cod fillet, hand-breaded with panko breadcrumbs, fried golden brown, and served on an appropriately sized hoagie roll with a side of Sauce Supreme. First, we sizzle fajita chicken, onions, and green peppers. Then, we add it all to soft, grilled flatbread, and top it with cheddar cheese, crisp lettuce, and chipotle sauce. Served with salsa and sour cream on the side. Two flour tortillas stuffed with fajita chicken, pepper Jack cheese, and caramelized onions, topped with our outrageously tasty chipotle sauce. Salsa and sour cream on the side, of course. Tuna salad – just like Mom used to make! Served on a buttery, toasted croissant with crisp leaf lettuce. Served with American cheese and shredded lettuce. Tartar sauce on the side. Our Whale – Music City Style! Served with Nashville hot tartar sauce, sliced pickles, and shredded lettuce. How do you make crispy fried chicken even more delicious? Top it with cheddar cheese and bacon! We finish it with lettuce, tomato, and mayo on a buttery brioche bun. A classic done right! Freshly-sliced corned beef, sauerkraut, melted Swiss cheese, and Thousand Island dressing piled high on our house-baked rye bread. Simply delicious. We grill up a 5 oz. chicken breast and top it with shredded lettuce and tomato on a brioche bun. Just like Mom used to make. (Actually — shh! It's better.) Tender, shredded pot roast on grilled Italian bread, covered with home-style gravy. A comfort food classic! We layer deli-sliced smoked turkey on sourdough bread and top it with a helping of home-style gravy. It’s a classic! Smoked turkey, American cheese, bacon, lettuce, tomato, and mayo on toasted white bread. Two Whale of a Cod fish sandwiches, Fresh Chips for two with Ranch dressing, and one pint of soup OR coleslaw. Two Whale of a Cod fish sandwiches, Fresh Chips for two with Ranch dressing, and one pint of coleslaw and your choice of soup. Two Whale of a Cod fish sandwiches, Fresh Chips for two with Ranch dressing, and one pint of mac'n cheese. It’s our famously HUGE cod fillet, without the bun! Tartar sauce on the side. Our Nantucket Cod served with three crispy butterflied shrimp tossed in OLD BAY® Seasoning. Served with a side of cocktail sauce. Oven-baked cod stuffed with our homemade blend of crabmeat, shrimp, spinach, onions, cheddar cheese, and cracker crumbs. Fresh, flaky cod fillet, topped with toasty, buttery breadcrumbs. Need we say more? Our enormous hand-breaded Whale of a Cod filet served with cheesy macaroni. The perfect pair! We bake shrimp in our scampi butter with red and green bell peppers, topped with breadcrumbs. We bake a flaky cod fillet and four shrimp in our scampi butter with red and green bell peppers, topped with toasty breadcrumbs. Our famous Whale of a Cod fillet with three crispy butterflied shrimp tossed in OLD BAY® Seasoning. Served with tartar and cocktail sauces. Double the flavor! Six juicy shrimp scampi and three OLD BAY® Seasoned fried shrimp. Surf and turf for the win! We pair our classic Ground Sirloin, topped with onion rings, with three crispy butterflied shrimp tossed in OLD BAY® Seasoning. Cocktail sauce on the side. Five breaded chicken tenders served with any of our dipping sauces or tossed in Buffalo sauce. Served with three crispy butterflied shrimp tossed in OLD BAY® Seasoning and ready to dip in cocktail sauce. Butterflied shrimp with a crispy coating of panko breadcrumbs and OLD BAY® Seasoning, served with cocktail sauce for dipping. Feeling zesty? You will be after digging into a bowl of grilled chicken breast, Italian sausage, onions and bell peppers, tossed with locally made Portogallo™ Pepper blend over pasta with our tomato cream sauce and Asiago cheese. Craving comfort food? We got you. Ziti baked with sliced Italian sausage, marinara sauce, and mozzarella cheese. One word: Mmmm! We prepare pasta with our creamy Alfredo sauce then top it with grilled chicken breast, fresh broccoli florets, and Asiago cheese. Herb-crusted chicken breast baked and served on a bed of penne, topped with mozzarella cheese and marinara, or our homemade meat sauce. Enjoy a serving of penne with your choice of marinara or our homemade meat sauce. Hand-breaded zucchini layered with Italian herbed ricotta and marinara sauce, topped with mozzarella and Asiago cheese. If we could, we’d put our homemade bruschetta on pretty much everything. It’s extra delicious served on our herb-crusted baked chicken breast, topped with balsamic glaze and Asiago cheese. Breaded tenderloins fried to perfection! Enjoy them tossed in Buffalo sauce or served with your choice of dipping sauce: BBQ, Honey Mustard, or homemade Ranch. Our tender boneless chicken breast is seasoned with rosemary and black pepper, then topped with sautéed mushrooms and a scrumptious white wine sauce. Tender boneless chicken breast hand-breaded with Parmesan breadcrumbs. Served with your choice of sauce (on the side). This is one serious stack! 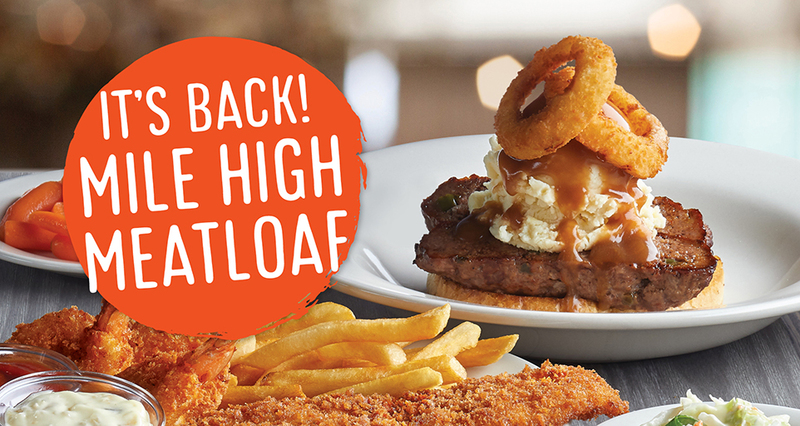 We start with a hearty slice of classic meatloaf, then top it with mashed potatoes, gravy, and crispy onion rings on buttered and grilled Italian bread. Oh-so comforting. Seasoned and served with gravy, grilled peppers, onions, and mushrooms. Available Monday-Friday, 5-11 AM. Grilled seasoned ground sirloin, two eggs, with breakfast potatoes or fresh-cut fruit, plus toast. Available Monday-Friday, 5-11 AM. Two eggs, your choice of three pieces of bacon, sausage, or turkey sausage, plus one of the following: two buttermilk pancakes, two slices of French toast, a Smiley Belgian waffle, or grilled Stickies. Available Monday-Friday, 5-11 AM. Two eggs, two strips of bacon, two sausage patties (or turkey sausage links), your choice of breakfast potatoes or fresh-cut fruit; plus, one of the following: two buttermilk pancakes, two whole-grain pancakes, two slices of French toast, a Smiley Belgian waffle, or Grilled Stickies. Available Monday-Friday, 5-11 AM. Two eggs, your choice of three pieces of bacon, sausage, or turkey sausage, with breakfast potatoes or fresh-cut fruit, and toast. 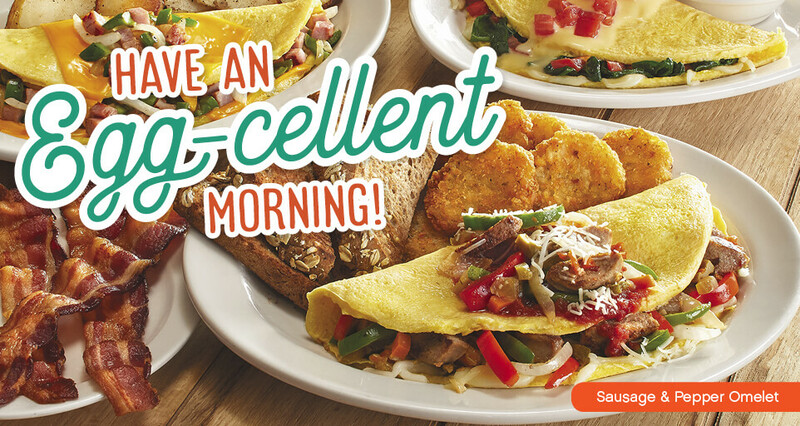 All your breakfast favorites…in a sandwich! Toasted bagel, scrambled egg, American cheese, and your choice of breakfast meat. A buttery, toasted croissant filled with two scrambled eggs, your choice of breakfast meat, and American cheese. Served with your choice of breakfast potatoes or fresh-cut fruit. Bon appetit! A buttery, toasted croissant filled with two scrambled eggs, your choice of breakfast meat, and American cheese. Bon appetit! Bell peppers, onions, sweet Italian sausage, mozzarella cheese, and locally made Portogallo™ Pepper blend, topped with marinara sauce and Asiago cheese. Tomatoes, spinach, and mozzarella cheese topped with our hollandaise sauce. Bacon, baked ham, sausage, and cheese. Baked ham, onions, green peppers, and cheese. Tomatoes, green peppers, onions, and cheese. Flapjacks. Hotcakes. Call them what you want — they’re delicious no matter what. Choose from blueberry, chocolate chip, or classic buttermilk. Flapjacks. Hotcakes. Call them what you want — they’re delicious no matter what. Go bananas for breakfast! Texas-cut French toast topped with bananas and our warm, buttery Bananas Foster syrup. Served with bacon, sausage, or turkey sausage. Not just for Sunday brunch! Toasty English muffins stacked with Canadian bacon, poached eggs, and silky smooth hollandaise sauce. Crispy, buttery, airy — oh, and Smiley, too! Enjoy our grin-inducing Belgian Waffle, served with syrup. Two eggs, two pieces of bacon, sausage, or turkey sausage, and your choice of toast, muffin, or biscuit. One egg, two pieces of bacon, sausage, or turkey sausage, breakfast potatoes or fresh-cut fruit, and your choice of toast, muffin, or biscuit. 1 egg, 2 pieces of bacon or sausage, and toast. 2 pieces of bacon, sausage, turkey sausage, or fruit, with your choice of the following: 2 Pancakes (Choose from Buttermilk, Blueberry, or Chocolate Chip), French Toast Stick Stack, or a Smiley Belgian Waffle. Choose marinara or meat sauce. Served with choice of rolls or bread and one side dish. Two chicken tenders served with choice of rolls or bread and one side dish. Full-bodied coffee, cold-brewed for smooth flavor without the acidity. Served black, and on ice. Enjoy fresh-brewed Eat'n Park coffee at home! Compatible with Keurig brewers. Our signature treat! **Note: Please call the restaurant for special requests, or orders of more than 2 dozen cookies. Our award-winning signature dessert! Homemade grilled stickies topped with vanilla ice cream and our warm honey sauce. Rich chocolate cake with a warm chocolate center. Dig into a slice of rich carrot cake, layered with cream cheese frosting. Our pies are fresh baked daily! **Note: To place an order of more than 2 pies, please call the restaurant.